Is the new Ford Focus RS the new hot hatch king? Autotrader gathers eight other rivals and determine which is the best. 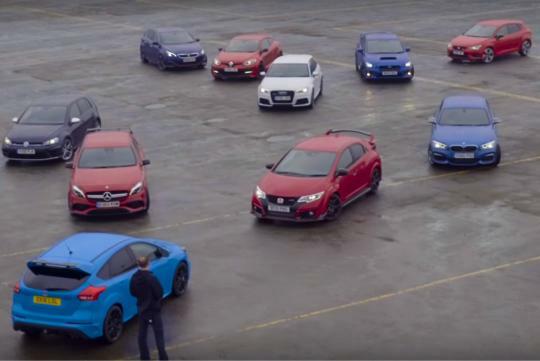 The cars featured in the comparison test includes the facelifted Mercedes A45 AMG, Honda Civic Type R, Seat Leon Cupra 290, Audi RS3 Sportback, Subaru WRX STI, BMW M135i, Renault Megane 275 Cup-S, Peugeot 308 GTI 270 and Volkswagen Golf R. Yes, we were wondering why the WRX is in there considering its no hot hatch but given that it has many traits a hot hatch has (turbocharged engine and AWD) we could understand why. So, which is their favourite hot hatch? Watch the video and find out for yourself. Mind you, the clip is nearly 30 minutes long!